Yes, like ruin your carpet. Not sure whether they will be any more attractive to the pigeons. Nice way to spend some time out the rain. I am not sure weather the Green paint make any difference , I think I would have just extended the White and left the Green out , still we all try something different from time to time and I hope you have hit the jackpot with your colour combination , I have got some the same as yours , I say the same but mine are perforated with shot holes , where yours look in mint condition . I also leave the green out. The green on a pigeon's neck is not that pronounced. Thing is, did you use ultraviolet paint, if not you will not get a pigeon near them, apparently pigeons cannot see ordinary white paint. 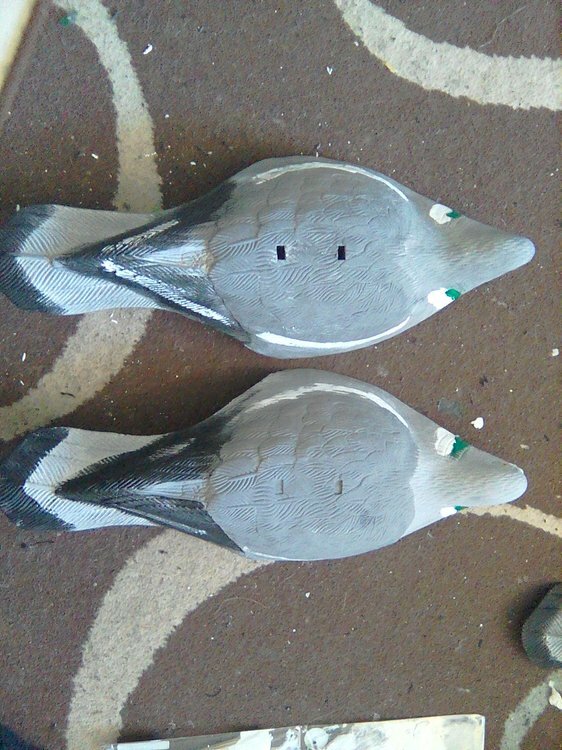 I used to repaint my decoys and they looked really bad afterwards, so I bought the sillosock covers and tried them, they work out at £2 each but last really well, I put all mine through the washing machine every once in a while and apart from all the pellet holes they look as good as new every time, I always 'touch up' the neck rings with ultra violet as the sillosock's are already treated with it on the white areas, they also fill out in the wind and turn half shells into full bodied decoys once inflated, I have never been tempted to try anything else and if I buy in more shells I just buy more covers for them, they look and work great. just need a few more pigeons to move into my permissions so I can really benefit from them. I noticed the reference to ultraviolet white paint above and it's a new one on me, I firmly believe that the person who does the original paint job has never even seen a pigeon so I do tend to tittivate my deeks using car primer paints in different colours - Grey, Black, White and red, mixing them as required. It has never occurred to me to use UV paint or even that it existed. I would be grateful if some kind, patient person could explain about the theory and benefits of UV White, also Which kind of paint is best? 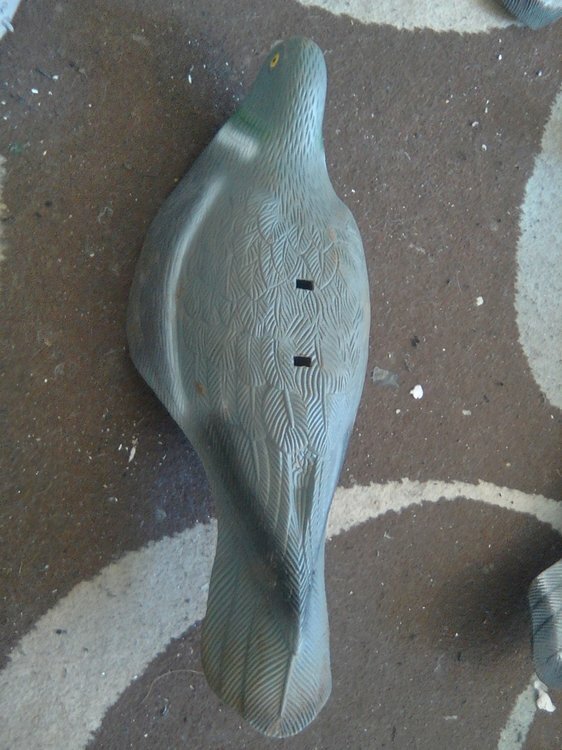 Do your repainted decoys pull pigeons? Not very well, I get few coming in, maybe some coming close enough for a shot. When I put a few dead birds out things tend to improve. When I started using a pigeon magnet last year the difference was really noticeable (in a good way) but of course, the birds on the magnet are real. 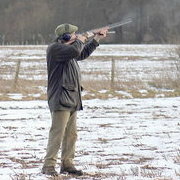 I only ever use dead birds and you will not better them for pulling pigeons, apart from live ones. Before I moved to only using dead birds I had some full body decoys, when shooting I always replaced the plastic decoys with dead birds as the day went on, these decoys had been repainted a few times over the years but never noticed any difference from when they were new, all I ever used for repainting was bog standard waterproof matt paint. I got my decoys out of storage (after 3 years) last weekend. I was pleased to find my 12 'dead bird shells' were in reasonable nick and still usable. They must be near 15 years old by now, so my amateur taxidermy skills obviously worked. When touching up I put a real pigeon on the bench for comparison so I can do my best to make the colours true to life (bad choice of words. )The pigeon's breast is pink, by mixing grey and red primer you can get a fairly good match and a lot better than the factory job. I agree dead birds are best but I don't have the storage facility which is why I try my best to improve my shell and full body decoys. There was a time when I'd cut off some wings and stick them onto my decoys but eventually tiny critters got in and started eating the feathers, it got messy so I stopped doing it. 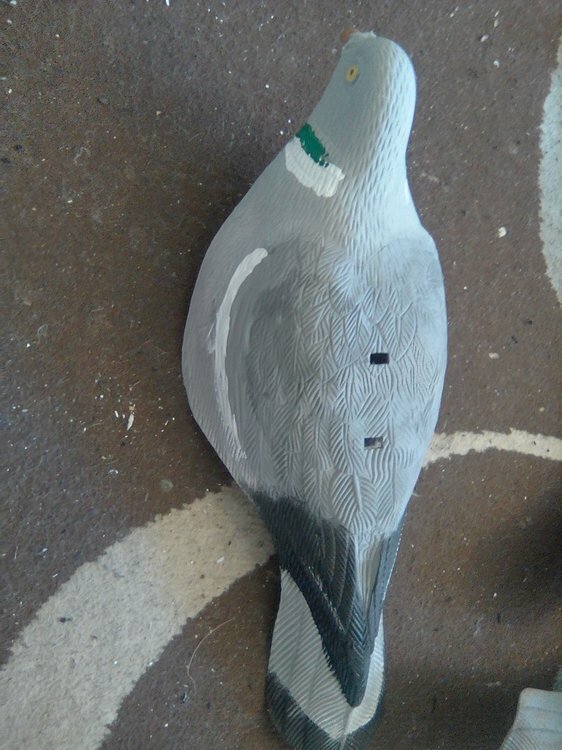 Incidentally, there is a huge difference in colours between different makes of decoys, some are a very pale grey, some have dark red backs, hence my comment that the people who paint them have probably never seen a real pigeon and this is why I try to make mine at least, all look the same. Gentlemen, the point of my post was to find out about white ultraviolet paint, is this really a thing or was it a wind up? The ultraviolet white paint is essential on any plastic or flock coated decoy. Without it the decoys act as pigeon scarers rather than attractors. If you get some daub it all over. The difference will be very noticeable. If you have full bodied decoys don't forget to paint the feet the correct colour too. Add some muddy brown if the pigeons have been feeding on wet fields. Thanks JDog, your comments were very helpful and I'm sure I will notice a difference, I'll be sure to pay particular attention to their feet, do you know where I can get Hampshire Brown in UV? The effect of the eyes can be devastating, out of my 24 plastic decoys 6 are eyes half closed in a wink and the further 18 have huge pupils.